Matthew 9:9-13, And as Jesus passed forth from thence, he saw a man, named Matthew, sitting at the receipt of custom: and he saith unto him, Follow me. And he arose, and followed him. 10 And it came to pass, as Jesus sat at meat in the house, behold, many publicans and sinners came and sat down with him and his disciples. 11 And when the Pharisees saw it, they said unto his disciples, Why eateth your Master with publicans and sinners? 12 But when Jesus heard that, he said unto them, They that be whole need not a physician, but they that are sick. 13 But go ye and learn what that meaneth, I will have mercy, and not sacrifice: for I am not come to call the righteous, but sinners to repentance. Matthew 11:18-19, For John came neither eating nor drinking, and they say, He hath a devil. 19 The Son of man came eating and drinking, and they say, Behold a man gluttonous, and a winebibber, a friend of publicans and sinners. But wisdom is justified of her children. 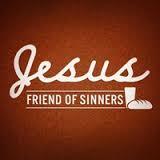 When was the last time you were accused of being a “friend of sinners” (Matthew 11:19)? No, it’s not a trick question. I’m serious! When was the last time someone called you a “friend of sinners”? When was the last time you were accused of being too loving towards someone who was outside of “the fold”? This was one of the many different criticisms Jesus received on a fairly regular basis from the “religious elite” of his day. While it might appear at times that Jesus went out of his way to stick it to the Pharisees and Sadducees, that isn’t the case. Jesus was just being, well, Jesus! And that bothered the religious leaders of his time. To be honest with you, it still does today! While we often say with our lips, “We hate the sin, but we love the sinner,” our lives often betray us! Remember, holy living is never an excuse to be unkind, unloving, and unfriendly to those who don’t know the Lord, or those who have drifted from the Lord. Jesus was the holiest man who ever lived. Yet, he was never unkind, unloving, nor was he unfriendly to the “sinners” of his day! Maybe the reason people today are drawn to Jesus but not his followers is because many Christians are NOT like Jesus— we don’t really see what Jesus sees in other people. We don’t really feel the way Jesus felt toward people straying far from God, living messy lives. Christians can subtly become pharisaical without even realizing it! … It does little good to call ourselves followers of Jesus if our lives and our influence don’t reflect Jesus’ life. … If we want to be more like Jesus than the Pharisees, we must make ourselves available to God’s Spirit to see and value those in need more than we value our own agendas. What if we simply made ourselves available to respond with mercy and compassion when God prompts? What might he do to begin restoring others through us if the workers were just available? The words above are definitely words worth pondering. It’s going to be hard to “win” them, if we aren’t willing to “befriend” them! Just taking a moment to reflect on those red letters of Jesus!! !